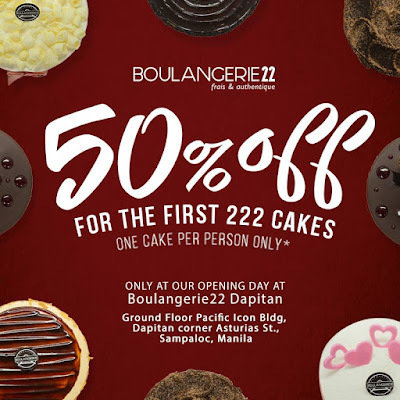 Check out the Grand Opening Promo of Boulangerie22 Dapitan on October 18, 2017 at the Ground Floor of Pacific Icon Building, Dapitan corner Asturias St., Sampaloc, Manila! Be there as early as 11am, and enjoy Boulangerie22 CAKES at 50% OFF! Yes, you read that right, HALF OFF! One (1) cake per person for the first 222 customers only!